The first thing you notice and enjoy about Jill is her positive attitude and boisterous energy! Jill greets everyone with a warm hug and an aloha because, as an abandoned toddler, she was adopted by a Hawaiian family that gave her unconditional love and support. Still, life always wasn’t a “day at the beach” for Jill. She beat thyroid cancer at an early age and moved to Arizona five years ago to start afresh, only to discover she had an incurable muscular disease. 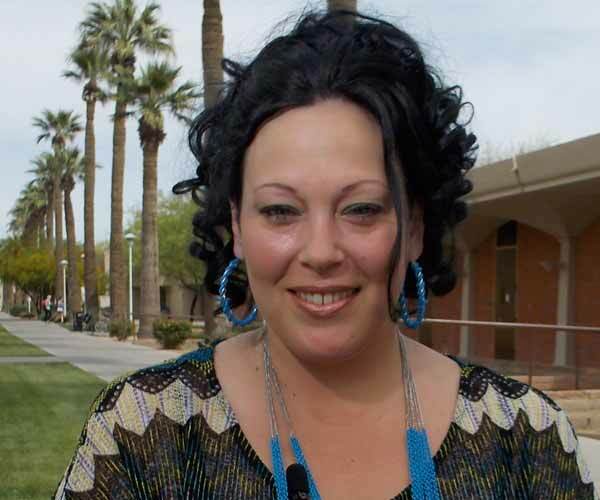 Even though she struggled with depression, she enrolled at GCC with hopes of a new beginning. While attending GCC, she was involved in an auto accident caused by a drunk driver. Jill had serious injuries so withdrew from school in order to heal. She thought about quitting but squelched the idea because of her GCC experience. Education invigorates Jill, and she could not even think of letting down the scholarship donors. “Once you start receiving scholarships, you know that others believe in you as well, and you can’t let them down!” she said with a huge smile. She has overcome many hurdles, but she has empowered herself with education and the plan to earn a degree in social work. She undoubtedly will help many in her bright future. Mahalo, Jill, for your uplifting spirit that reaches out and touches everyone!